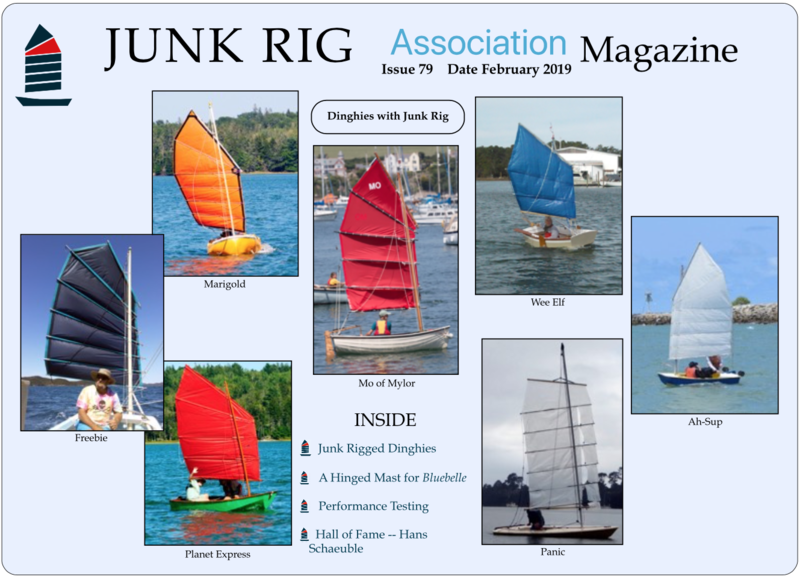 The name of the Association is The Junk Rig Association, hereinafter referred as the JRA or the Association. This Constitution is an agreement made between the members of the JRA. 3.1 to promote and encourage discussion of junk rig (JR), including its traditional use, its design, and developments of it, and of the building and use of vessels with such rigs and their derivatives. 3.2 to facilitate contact and communication between members of the Association. 4.1 Membership is open to anyone who supports the Aims and Objects of the JRA and pays the subscription set annually by the Committee and approved by the membership at the Annual General Meeting (AGM). 4.2 A number of categories of membership shall be defined by the Committee to reflect the diverse needs of the membership. Every paid-up member shall have power to vote at all general meetings of the Association. 4.3 The Committee may appoint Honorary Members of the JRA in recognition of an outstanding contribution to furthering the aims and objects of the Association. 4.4 Every member undertakes to comply with the Constitution of the JRA, and the Committee, by a majority vote, may suspend, restrict or terminate the membership of any person for any conduct tending to bring the JRA into disrepute or for conduct contrary to the Aims and Objects of the JRA. 4.5 Membership will automatically lapse for any member whose annual subscription is more than three months in arrears. No member whose annual payments are in arrears may vote at any JRA meeting. 5.1 The conduct and affairs of the JRA shall be managed on behalf of the members by a committee elected by the membership. 5.2 The Committee shall consist of a Chairman, a Secretary,a Treasurer, a Webmaster, a Membership Secretary, a Sailing Secretary and one (1) further member (without portfolio). The Committee is specifically authorised to appoint not more than two (2) further members with full voting rights, as and if they think fit. 5.3 The Chairman, Secretary and Treasurer’s posts shall be held by three individual committee members. In the event of any of these officers being absent, unable or unwilling to perform his duties for a minimum period of six weeks, this rule may be waived but only for a maximum period of three months. 5.4 A quorum at any real or web-based committee meeting shall be satisfied when at least two- thirds of the eligible committee members are present or are actively involved in an on-line committee meeting and that all serving committee members have been given adequate prior notice of the meeting. 5.5 All resolutions put to a vote by the committee shall be deemed passed by a simple majority of those members voting as individuals with one vote per person irrespective of the number of committee posts they hold excepting that the Chairman shall have a casting vote. 5.6 No member of the Committee may receive payment for performing their duties but may receive essential out-of-pocket expenses claimed for documented necessary expenditure. Any such expenses above £25 shall require prior approval by another member of the Committee. 5.7 All members of the Committee shall be paid up members of the JRA. They shall be elected at the AGM, and hold office for one year terminating at the end of the next following AGM. They may stand for re-election. A candidate for election to the committee shall provide a manifesto of up to 200 words which shall be shown next to his/her name on the voting form. He or she shall be proposed and seconded by paid up members of the JRA. The latest date for nominations shall be published in the preceding edition of the JRA magazine and on the JRA website. Nominations shall be submitted to the Secretary or Chairman, either by email or by post, and shall arrive before midnight on the latest date for nominations. The nominations shall be circulated to the rest of the committee at the earliest reasonable opportunity. 5.8 Additional members may be co-opted onto the committee to fulfil specific roles for a period of time determined by the committee. These members shall not have voting rights on committee matters and shall cease to be co-opted members at the next following AGM. 5.9.1 Oversee the functioning of the JRA. 5.9.2 Chair all meetings of the Committee and any general meeting of the Association or act as Chair/Moderator of any such web-based meetings. In his absence he shall arrange for another full committee member (as specified in paragraph 5.2) to deputise. 5.9.3 Have an additional casting vote in the event of a tie in any ballot, with the exception of a vote on changes to the Constitution. 5.10.1 Conduct the correspondence of the JRA. 5.10.2 Ensure all JRA documents are securely stored and maintained. 5.10.3 Ensure that minutes are kept of all general meetings and committee meetings of the JRA whether actual or web- based. Such minutes shall be approved as a true and accurate record by those members who attended, at the next appropriate meeting, and then signed by the Chairman of that meeting. Draft copies of the minutes shall be circulated by post or electronic means to all committee and ordinary members of the Association as appropriate and within twenty one days of the date of the meeting. 5.11.2 Prepare in each year an Annual Balance Sheet and Statement of Income and Expenditure as at 31st March and cause such Accounts to be independently examined by a competent person and thereafter circulated to the all members of the Association by electronic or postal means at least twenty one days before the date of the AGM. 5.11.3 Require any sub group involved in financial matters to provide the Treasurer with full details of income and expenditure within 14 days from 31st March. 5.12.1 Ensure the smooth running of the JRA website. 5.12.2 Help and advise members in its use and maintenance. 5.13.1 Ensure that membership records are accurately maintained. 5.13.2 Help and advise members in joining, in renewing their membership and in updating their records. 5.14.1.2 Responding to specific requests. 5.14.2.1 Skippers prepared to provide first JR familiarisation sails. 5.14.2.2 JR skippers looking for regular crew. 5.14.2.3 Potential crew looking for regular berths on JR boats. 5.14.3 Draw the attention of members to Constitution clauses 8.1 and 8.4. 6.1 General meetings of the membership of the JRA shall be conducted in a single physical location. The committee shall endeavour to arrange facilities for members who cannot attend to make written and verbal contributions whether submitted prior to the meeting or electronically in real time to the meeting. The physical meeting shall be preceded by a web based meeting, through a general meeting forum open to the whole membership, in which the agenda items may be discussed. Contributions to the web based meeting shall be construed as being written submissions to the physical meeting. 6.2 Non-general meetings of the membership of the JRA may be held in such a manner as the participants shall decide. 6.3 For any meeting requiring a decision by ballot, the Agenda along with details of the business of the meeting, voting forms, copies of the accounts (AGM only) and a list of members seeking election or re-election to the Committee along with their prospectus shall be circulated to all paid-up members by electronic or postal means at least twenty one days before the date of the meeting to allow members who are unable to attend in person to consider and respond to the business of the meeting and vote by post, proxy or electronic means. These votes must be received by the start of the actual meeting to be valid and shall not be disclosed to the members before being added to the votes taken at the physical meeting. 6.4 At any general meeting, a quorum will be satisfied when the names of 15 separate members have been recorded as having participated in the web based meeting through the general meeting forum OR attended the physical meeting OR participated remotely in the physical meeting. 6.5.2 Receive a report from the Chairman. 6.5.3 Receive a report from the Secretary. 6.5.4 Receive a report from the Treasurer and approve the accounts. 6.5.5 Elect members of the Committee for the following year. 6.5.7 Appoint an independent auditor for the following year. 6.5.8 Attend to any other business. 6.6 The Secretary must call a Special General Meeting (SGM) within twenty one days of receiving a request from the committee or a written request signed by not less than 20 ordinary members. 7.1 The JRA shall be a non-profit-making organisation. The funds of the JRA shall be used to maintain or improve the services provided to its members and to promote the aims and objects as set out in Clause 3. No profit or surplus will be distributed except under the terms of clause 9 (Dissolution of the Association). 7.2 The financial year shall run from 1st April to 31st March. 7.3 Members shall pay subscriptions as approved by the members at the AGM. 7.4 At the end of each financial year the accounts shall be examined and verified by an independent auditor. 7.5 Access to the JRA finances shall be controlled by the Chairman, The Secretary and the Treasurer. 8.1 The JRA will not accept any liability for damage or personal injury arising out of the use of any premises, vessels or any other facilities arranged or provided by the JRA either sustained by members, their guests or visitors or caused by the said members, guests or visitors whether or not such damage or injury could have been attributed to or was occasioned by the neglect, default or negligence of any of them, the Officers, Committee or servants of the JRA. 8.2 Membership of the JRA and acceptance of this constitution by the member will be deemed to constitute consent to the holding of relevant personal data for the purposes of the Data Protection Acts. 8.4 Boat owners who participate in any junk rig rally or function shall be advised to carry third party indemnity insurance. The JRA may be dissolved by a resolution passed by a two-thirds majority of those voting in a Special General Meeting, provided that notice of the meeting, stating the terms of the resolution to be proposed, has been circulated to the membership not less than twenty one days before the start of the meeting. The Committee shall then wind up the affairs of the JRA. If any assets remain after settling any bona fide liabilities they shall not be distributed amongst members but given to such other marine orientated organisation or organisations for their benefit or the benefit of the community as the Committee shall decide. This Constitution may be amended by a resolution passed by a two-thirds majority of those voting in a Special General Meeting, provided that notice of the meeting, stating the terms of the resolution to be proposed, has been circulated to the membership not less than twenty one days before the start of the meeting.